Lisbon’s water company EPAL has announced that it terminated a technology exchange deal with Israeli state water company Mekorot following protests over Mekorot’s role in Israel’s ‘water apartheid’ over Palestinians. Portuguese MPs and campaign groups had argued that the deal amounted to support for Mekorot’s role in the theft of Palestinian water. Mekorot, who lost out on a $170m contract with Argentinian authorities earlier this year following similar protests, illegally appropriates Palestinian water, diverting it to illegal Israeli settlements and towns inside Israel. The state owned company is the key body responsible for implementing discriminatory water polices that Amnesty International has accused Israel implementing “as a means of expulsion”. “Many Palestinian communities suffer from a lack of access to adequate water due to the encroachment of Israeli settlers on water resources and to Israeli policies and practices that deny Palestinians the human right to water,” explained Dr. Ayman Rabi from Friends of the Earth Palestine / PENGON. EPAL this week responded to fresh calls to terminate its relationship with Mekorot by announcing that it had terminated their relationship with Mekorot in 2010 when the public campaign against the collaboration was at its height. The campaign saw large demonstrations in Lisbon’s main square and pressure against local authorities. A statement released by the coalition of Portuguese organisations that campaigned against Mekorot said that the decision will “strengthen and encourage the efforts of solidarity movements that work towards the international isolation of Israel because of its policies of ethic cleansing, occupation and colonization”. The EPAL announcement follows a similar decision by municipal authorities in Buenos Aires and Dutch national water carrier Vitens and comes at the end of an international week against Mekorot that saw demonstrations and campaign actions take place across at least 12 countries. In Paris, BDS France activists burst into a luxury hotel where delegates from Mekorot were taking part in a business breakfast as part of the Global Water Summit. Campaigners urged dozens of stunned delegates not to cooperate with the Israeli water company. A French parliamentary report has accused Israel of imposing a system of “water apartheid” in the occupied Palestinian territory. The French mobilisation followed a noise demonstration that disrupted a London water conference that was being addressed by Mekorot and other Israeli water companies. In Rome, a ‘water checkpoint’ street theatre protest highlighted the campaign against collaboration between Mekorot and the city’s water company ACEA. The campaign is backed by the broad coalition of campaign groups resisting privatisation of water. In Argentina, the Congress of the Trade Union Federation Capital (CTA Capital) was dedicated to the campaign against Mekorot and hosted a discussion of how Mekorot is attempting to export discriminatory water policies developed in Palestine to Argentina. The session celebrated the successful campaign that led to Mekorot losing out on a $170m contract and discussed how best to prevent Mekorot from being awarded other contracts it has won or is bidding for. A seminar in Uruguay brought together Palestine solidarity, environmental and anti-privatisation groups to discuss struggles for water and land in Uruguay and Palestine. On March 22 world water day, more than 250 people joined a Thunderclap Twitter storm that had a social reach of over 300,000 people. Campaigns against Mekorot are also underway in Greece. “The amazing reach of the first week against Mekorot and the fact that public authorities are increasingly refusing to collaborate with Mekorot are further signs that people and governments across the world are no longer prepared to fund Israeli apartheid,” said Jamal Juma’ from Stop the Wall, a member of PENGON/Friends of the Earth Palestine, one of the Palestinian organisations that called for the week of action against Mekorot. 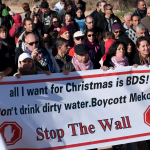 “We call on people all over the world to continue to take action against Mekorot and its attempts to export Israel’s discriminatory water policies,” he added.